This isn’t one of those game-changer posts. The type that is being published a lot right now. It’s not designed to force the industry to confront its entrenched structural problems. I have no epiphany with which to inspire you to do great work in new ways. I’m not advocating a new future for yourself, nor am I revolting against the agency model. I wouldn’t presume to know the answer, or have that much clout. But I do have some news. And it is about a different path. It’s small for the industry. But big to us. I am leaving Isobar – and London – at the end of October. We are moving to Bristol. It’s been a bit of a shock to some. Others have responded with warmth and, sometimes, envy. Some people get it straight away, but lots of reactions often come in the form of questions. Why, since when, why, what, how soon, why? Why sure does crop up a lot. You feel obliged to provide a clear narrative when, of course, there isn’t one. There are just multiple characters, many different motivations and competing sub-plots. But here’s my best effort. My wife and I have been in London for fifteen years. We were just kids when we arrived – 23, 24. We’ve picked up friends and put down roots, owned two houses and had three children. My mum says we’ve given the lie to the idea that London has to be lonely. The opposite is true, in fact – we’ve had an amazing time. I would recommend it to anyone. But now we are going. Lots of working parents in London leave. Particularly, I suspect, those who didn’t grow up here. Maybe they return to what’s familiar. Maybe they choose the commuter belt as the door to a better quality of life. Most chase the middle-class ideal of ‘more space’. We can identify with that. The bigger children get, the more space you crave – inside the house and beyond it. We love urban living, though. The buzz, the culture, the coffee. Community and anonymity. We also want fulfilling work alongside a home life that doesn’t feel like it’s squeezed into the gaps in between. And while I have enjoyed my work more in the last few years than at any other time in my life, at some level I think all five of us felt we were paying for it. In time, mainly. Time with and for each other. I think we’re ready as a family to make a new contract with ourselves. One with different terms for everyone. Our vision was a city life with home, school and work all within 15 minutes of each other. Sounds simple, but as with most things that are simple, it took a long time to get to. About five years of talking about The Future. Trying to agree on what’s important and working out how we might build a life around that. And that’s before you work out whether it’s possible. But we got there. And we settled on – arrived at – Bristol. We used to live there, but it’s been long enough to feel like new as well as familiar. It’s a fertile, creative city. Graffiti and green space in equal measure. Annual festivals named after and celebrating the important things in life – like balloons! and ideas! It’s the European Green Capital for 2015. The Watershed has a Playable City award to reward initiatives that celebrate the use of technology to help citizens reclaim their civic space. It’s a cool place. The sort of place we like. And there’s a brilliant scene of smart, creative, digital businesses, too. From November I will be head of strategy at one: True Digital, a full-service digital agency based in the heart of Bristol. They are ten years old, independent and keen to expand. They are smart, analytic and friendly. They understand that insight powers creativity, and that creativity is an essential ingredient any client needs from its agency to help deliver commercial success. But I’m also sad, and a little scared too. Sad because London is the place we’ve made our home. Our friends and memories are here. That’s hard to let go of. And then there’s the agency. Isobar is about to have an amazing couple of years. In Nick, Jon and Pats it has gifted, inspirational leaders that will create something brilliant. They carry people with them and I’m envious of the people going on that journey. But as Scott said to me recently, any decision worth making has a lot at stake. To gain something you need to give up something. Acknowledge the discomfort, but don’t second-guess yourself. So, we’re riding the emotional wave. We’re four-fifths left already, and I finish at Isobar next week. We don’t fully know how we feel about it, of course, but I suspect we won’t quite know that for a long time. That’s OK. It’s a decision for two, five, ten years’ time as much as it is for now. And I’ve had enough people tell me they’re jealous that there might just be something in it. Scared is OK too, though. Scared can galvanise. As I’ve quoted before, boldness has genius, power and magic in it. You can’t learn what you’re capable of without leaps into the unknown. And I’ve had a few of those. Moving to London and taking a graduate job in media sales. Jumping at the offer from MEC to get out of that and into agencies. And when someone like Pats offers you a role as head of social strategy at Isobar, it needn’t get in the way that you’ve never done social before, nor ever worked in a creative agency. Just go for it. These leaps have allowed me to learn loads, from so many amazing people. So, really, this is just the next scary leap. Only this time it hasn’t chosen us. We’ve chosen it. 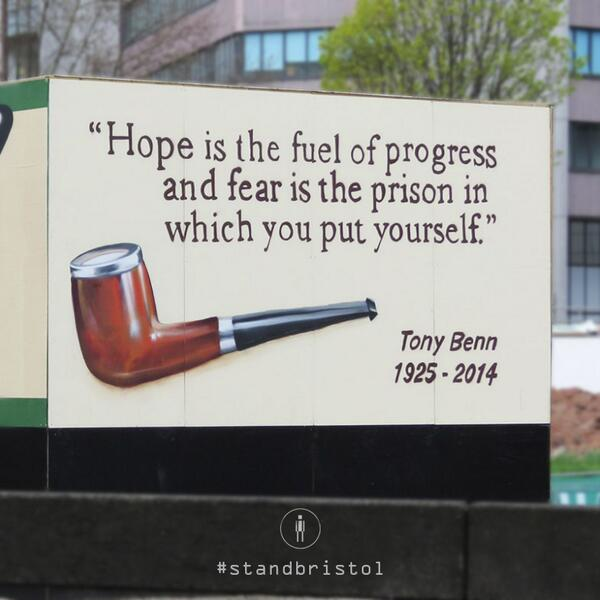 Until recently, arriving into Bristol from London by car meant you would be greeted by a sign, featuring a quote from Tony Benn, a very Bristol sort of hero. I kept seeing it as we started our explorations a few months back. Whenever I’ve felt uncertain, it’s come back to me. Time to take the leap. You are Banksy, and I claim my £10 !!! Thanks Kelvin. And that’s a lovely quote, too. Feel the fear and do it anyway. Wishing you and the family all the very best of luck in the new chapter of your adventure. My goodness, that’s a surprise. But I understand completely why you made this decision and I’m fairly certain you will not at all regret it. London will miss you, but with the web, I’m sure you will be as present as you ever were! All the very best to all five of you. May the wind beneath your wings take you far. People in the industry are held to London by a psychological umbilical cord. For many the idea of cutting that cord really is as strong an emotional wrench as breaking some kind of maternal bond. London isn’t just the centre of the universe, it is the universe. You’ll quickly discover that leaving is an act of liberation rather than abandonment. You are doing it for all the right, well-considered reasons. It is an entirely positive move. You clearly “cut it” in London and I wouldn’t be surprised if you end up doing your best work out of Bristol if your new agency empowers you as much as Leith and then Blonde have empowered me out of Edinburgh. “Out of” is the phrase. You work out of Bristol, not in Bristol. Just like W&K worked out of Portland. Great move. Great post. Best of luck. Thank you, Phil, That really means a lot. As you know you were a definite reference point for me for a move like this – I think “out of” is brilliant. Thanks too, Anjali and Em. So lovely to get such nice comments.